Enjoy Dinner at one of the local restaurants. ﻿Just as the sun sets behind the majestic Cross Hill and the edge is taken off the thermometer, visit the ﻿Castroville Regional Park﻿ for a leisurely stroll among the pecan and cypress trees or really work off that dinner with a trip on one of the hiking trails. If you get to the top you'll be able to take in all the beauty of the Medina Valley and surrounding area. It'll be worth it. Enjoy breakfast or brunch at one of the local restaurants. 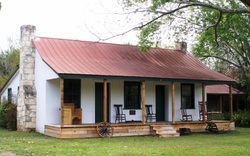 Stroll or drive around town taking in the numerous shops, antique stores and historical sites. Enjoy a light lunch along the way. 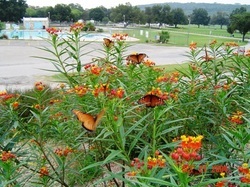 Visit www.castroville.com for an informative list of things to do in Castroville. 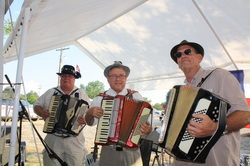 6:30 pm -10:00 pm Join the music, food and fun at the Saturday Biergarten and Boardwalk festivities at Koenig Park. Live music and lots of games for the kids. Enjoy the perfect festival food: Sarge's St. Louie Red Hots with all the trimmings or piping hot pizza! Wash it all down with a cold beverage of your choice. ﻿9:30 am Holy Mass at the historic St. Louis Church, presided by Bishop Michael Boulette with singing by the internationally renowned Liederkranz Choir of San Antonio. It's time for the 137th St. Louis Day Celebration, so hop on the convenient SHUTTLE BUS parking at St. Louis Church on Angelo Street that will drop you right off at the gate to Koenig Park. Parking near Koenig Park can be limited, so the bus is a great way to avoid the hassle. Be sure and buy your meal ticket and grounds tickets as you get to the bottom of the hill. 11:00 am The serving of the famous St. Louis Day two-meat BBQ plate begins. Enjoy your meal under the spacious Koenig Park Pavilion, or grab your plate and head for the shady Biergarten area and dine to the live music on stage. 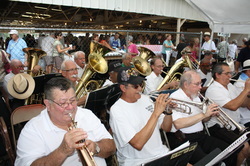 Spend the rest of the day strolling the grounds while taking part in the various Boardwalk Games, the famous horseshoe pitching tournament, washer tossing, bingo or the exciting St. Louis Downs horseracing game. Live music is played throughout the entire day from three different venues, ensuring there'll be something you like. If you need time to cool off, step inside the air-conditioned Koenig Park Hall and browse the giant Silent Auction or Country Store. There's plenty to do and enjoy at St. Louis Day. Somewhere along the way, be sure and drop by the Visitors' Center and Memory Lane tent and sign the guest book. When your day has been fulfilled, a simple stroll back to the main gate will find the shuttle bus waiting to take you back to the church parking lot and your vehicle. Thanks in advance for joining us friends, and we look forward to seeing you! God speed and safe travel.